After giving Adam a tour of Eden, God gives it to him as a gift. Adam is given one commandment: From the tree of knowledge, good and evil, you surely shall not eat, for on that day you will die. There is a very cunning serpent in Eden. An indication of how cunning, is that the creature argues like a lawyer. He begins by misrepresenting what God said to Adam: Though God said you shall not eat of any tree of the garden... Eve interrupts to correct him: It is only from one tree and it is because they would die if they ate it. 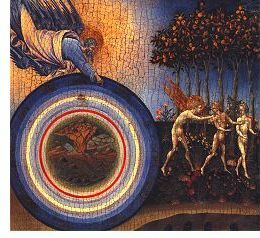 Now the serpent encourages Eve to believe God has misled them about the forbidden fruit: You shall not be doomed to die. For God knows on the day you eat of it you shall become like the gods with knowledge of good and evil. The Hebrew Bible says that when Eve saw the fruit, she desired it greatly. After tasting it, she gave it to Adam. "And the eyes of the two were opened and they knew they were naked". The Lord enjoys walking in His garden in the cool of the day. On this afternoon, He calls for them. They are in hiding. Why?, He asks. We are naked, they cry. Who told you you were naked? But He knows the answer. Much angered He directs his curses first to the serpent, then to Eve and finally to Adam and Eve together. The curses apply as much towards their ancestors as themselves. This tragic story with which the Book begins has been the subject of innumerable works of art. Surely the most awesome are Michaelangelo's frescoes for the Sistine Chapel. Goethe said it best: We would not know what it meant to be fully human had not Michaelangelo created these images.